Flying discs to be distributed over several weeks to locations in Boise, Meridian and Nampa. We hope these donations of flying discs serve to provide pet owners and their four-legged family members with new opportunities to enjoy the Treasure Valley’s wonderful dog parks. 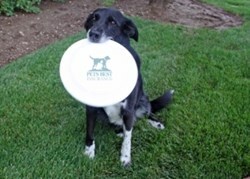 Pets Best Insurance, a leading U.S. pet insurance agency based in Boise, announced today it will donate flying discs to dog parks and animal shelters throughout the Treasure Valley. The hardy toys will be distributed over the next few weeks to a total of six dog parks in Boise, Meridian and Nampa, as well as several animal shelters in the area. The flying discs distributed to local animal shelters will provide many dogs with new ways to exercise with volunteers. Play time and exercise can play an important role in keeping dogs healthy, in addition to reducing boredom and stress. Dr. Stephens, a veterinarian, founded the pet insurance industry in the U.S. in the early 1980s with the aim of reducing euthanasia when pet owners couldn’t afford veterinary treatment. Dr. Stephens launched Pets Best Insurance in 2005. For more information about the pet insurance plans offered by Pets Best Insurance, visit http://www.petsbest.com . Dr. Jack L. Stephens, president of Pets Best Insurance, founded pet insurance in the U.S. in 1981 with a mission to end euthanasia when pet owners couldn’t afford veterinary treatment. Dr. Stephens went on to present the first U.S. pet insurance policy to famous television dog, Lassie. Pets Best Insurance provides coverage for dogs and cats and is the only veterinarian founded and operated pet insurance company in the United States. Dr. Stephens is always available to answer questions regarding veterinarian medicine, pet health and pet insurance. Visit http://www.petsbest.com for more information. Pet insurance plans offered and administered by Pets Best Insurance are underwritten by Independence American Insurance Company, a Delaware Insurance company. Independence American Insurance Company is a member of The IHC Group, an insurance organization composed of Independence Holding Company, a public company traded on the New York Stock Exchange, and its operating subsidiaries. The IHC Group has been providing life, health and stop loss insurance solutions for nearly 30 years. For information on The IHC Group, visit: http://www.ihcgroup.com . In states in which Independence American Insurance Company’s new policy form has not yet received regulatory approval, Aetna Insurance Company of Connecticut will underwrite policies. Each insurer has sole financial responsibility for its own products. To determine the underwriter in your state, please call Pets Best at 1-866-929-3807.